Bhadrakali Temple is said to be one of the oldest temples of Goddess Bhadrakali in India. 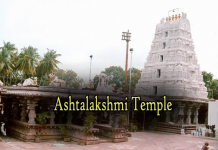 It is situated on a hillock near Bhadrakali Lake, a scenic location between Hanamkonda and Warangal. The temple was built in Chalukyan Style of Architecture. Travel Tips: 1. Musical Garden & Planeterium (1 Km) can be visited along with this place. Timings: 5 AM to 1 PM & 3 – 9 PM. Brahmotsavas are held every year in the month of April/May in a grand manner. The festival attracts thousands of devotees from all over the region of Telangana. At a distance of 5 Kms from Warangal Railway Station, the Bhadra Kali Temple is situated on top a hillock towards Hanamkonda. This temple is famous for 2.7 meter stone idol of the deity with eight arms and a weapon in each hand, in sitting posture. This deity is believed to be worshipped by the Chalukyan ruler Pulakesin-II in the year 625 AD. During the season of ‘SravanaMasa’, means in the month of August and September as the deity is exquisitely decorated and yagnams are performed in the temple. Thousands of devotees from all over India flock to this temple during this time. October to March is also a good time to visit, as the weather here remains very pleasant. Goddess Bhadrakali is considered to bevery powerful and is known to fulfil the wishes of her true devotees. The Bhadrakali Temple, straddling over the tri cities of Telangana namely: Warangal, Hanamkonda and Kazipet, is a major tourist attraction and a significant pilgrimage destination. The temple is dedicated to Goddess Kali, found in peaceful mood. This temple is located on the banks of Bhadrakali Lake. There is a park adjacent to the temple along Bhadrakali Lake which also has a shrine for Lord Siva in the form of Sri Chandra Mouleeswara.